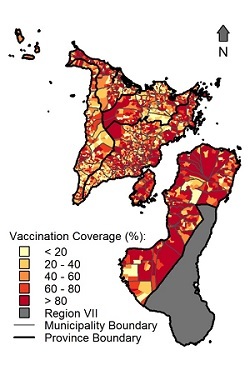 When vaccination coverage levels in Region VI of the Visayas of Philippines, were mapped, they showed great variation across different areas. Whilst the overall vaccination coverage achieved (higher than 70%) was high, it was very uneven and areas with less than 40% or even less than 20% vaccination coverage existed. Modelling of the actual vaccination coverages achieved, along with realistic estimates of dog movements for the area allowed the study to examine the probability that rabies would be eliminate from dogs. The uneven coverage meant that the probability of rabies elimination was much lower than it would be if the same overall vaccination coverage had been applied equally everywhere. This is because the areas with low vaccination coverage allow the rabies virus to continue to circulate. The study concluded that dog movement restrictions would not have had a significant impact on the control of the disease in this endemic setting. Instead, focusing on even vaccination coverage was expected to reduce the number of annual vaccination campaigns required to reach a high probability of rabies elimination from six to three. Ferguson et al. 2015 "Heterogeneity in the spread and control of infectious disease: consequences for the elimination of canine rabies."